Almost no e-commerce wholesaler is willing to share their pricing strategy publically. Instead, customers need to login or contact directly. The reason is quite simple. Besides product quality and customer service, price is the most critical competitive advantage in the B2B world. Who else wants to share such the secret to competitors? Not to mention, price is kinda flexible based on order quantity, type of customer group, or private promotion. Unlike the B2C shoppers who even feel no need to interact with the seller, wholesale customers usually want to communicate more and keep in touch for a long-term relationship. The hidden price not only helps them to focus on product true values but it also indicates a room for negotiation. If they are interested enough, they are ready to start a sales conversation following the Call for price information shown. More and more merchants choose Magento 2 platform to launch their wholesale stores due to its rich features. Still, there are lots to improve. Under B2B Category, this Call for Price extension is among the best-sellers. The feature list is the combination of the basic hide price and advanced call for price function. Hence, it is also called Magento 2 Hide Price Call for Price extension. 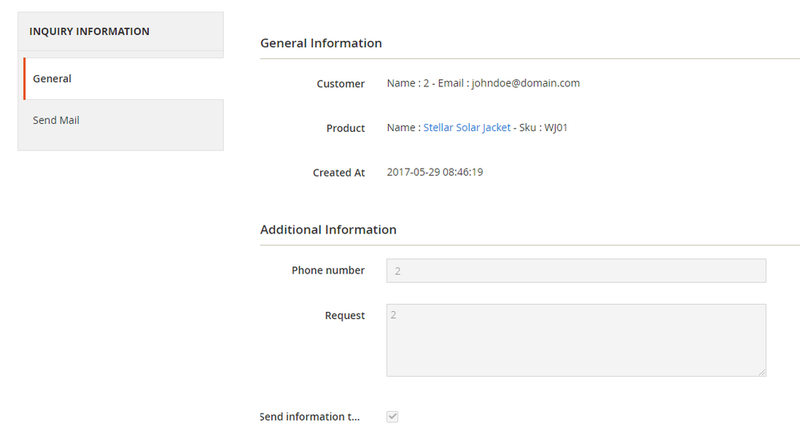 Once features are enabled, the price of the selected products will be disabled on any page: Home Page, Product pages, Categories, Wishlist, Comparison Page, Related/Up-Sell/Cross-Sell Block. You can choose to use Hide Price Config or Call for Price Config for particular products, categories, or customer groups as wanted. 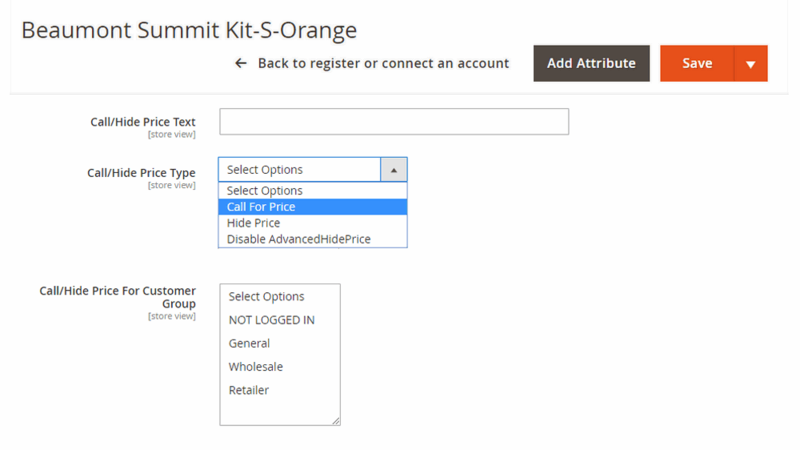 Magento 2 Hide Price Call for Price extension gives the flexibility to hide price based on customer groups and/or categories. This feature is essential for B2B stores to disable price for non-logged-in customers, for example. 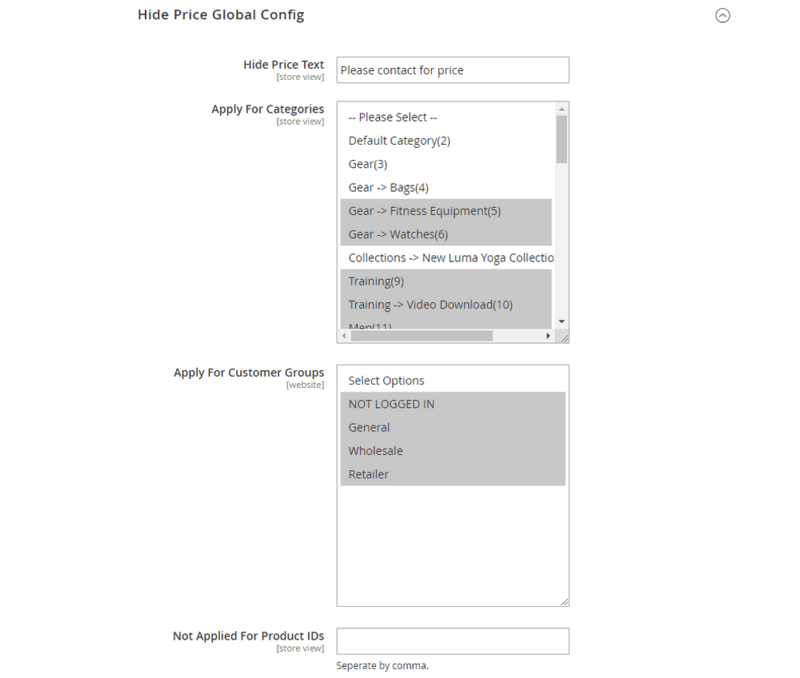 We also expand the default Product Edit page with additional fields to customize set up hide price configuration message for specific products if needed. Above basic Hide Price features seem quite enough for those wanting to hide price and show call for price message. However, B2B merchants need the more convenient way to collect customer information and manage the price request. Thus, we enhance the features with Call for Price configurations to fit that demand. Similarly, merchants can enable Magento 2 Call for Price features for particular customer groups, categories, or turn them right on product edit pages. Merchants can also replace Add to Cart button with custom text. 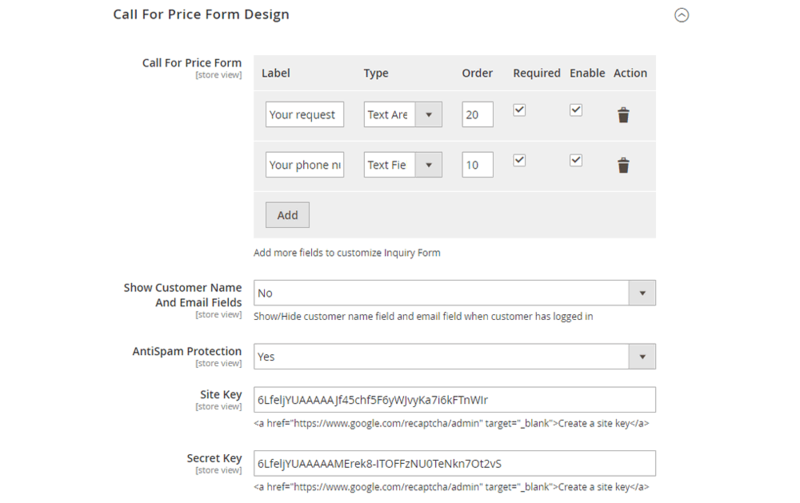 Moreover, this text will be linked to a Call for Price popup so that customers can submit a price request easily. This field form can be customized for the purpose of gathering information. When allowing customers to submit the request for price, merchants might sometime face the headache of spam. No need to worry since we enable Google reCaptcha in the form for AntiSpam purpose. Just sit back and enjoy Magento 2 Call for Price features. When the customer submits the Call for Price successfully, their information will be saved in Customer Inquiry List. Here, the merchant can check the request information sent and reply the customer timely, normally via email set in advance. In a nutshell, Magento 2 Call for Price is essential to keep your price private for non-targeted customers as well as to promote productive interaction with customers. Wanna see how this advanced hide price is in action? I wanna give my thanks to the support team as they helped me a lot when Magento 2 Hide Price/Call for Price didn't work on my sites. Now every feature is smooth and flawless. Thanks a lot! Magento 2 Hide Price/Call for price worths every penny with wonderful features. Thank you so much! Look forward to other helpful modules. Hide Price/Call for Price for Magento 2 extension is really a good plugin to hide price from some groups of customers as needed and encourage them to register for more information. Great! After purchasing Magento 2 Call for Price extension, I asked for some customizations and the support team has lived up to my expectations. I'll recommend this module to others. I've used Magento 2 Hide Price/Call for Price for 2months and got all the described features worked out of the box. Thank you! This extension is exactly what I want to get in touch with potential customers by requesting them to contact for quote. Five stars for a good deal! A good deal for wonderful features! This 2-in-1 extension truly save time and money! 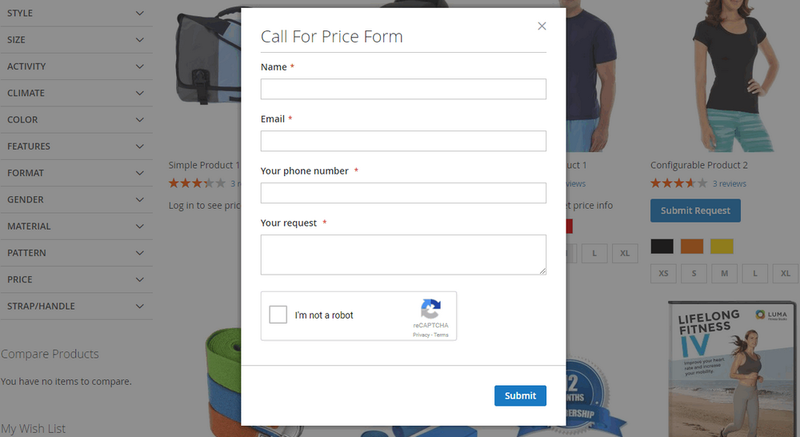 Not only can I hide price from specific customer groups, but I can also send price request via the contact form. I bought the extension and didn’t like how the Call For Price look, so I ask for customization. The support was quick to respond and offer a good solution for the request. I definitely look forward for other extensions from BSS! The price is cheaper compared to some other hide price extensions and the function is absolutely no doubt the best! Effective to hide product price and perfect to use for jewelry shop to announce price privately for customers. But it's quite complicated to use, too many config. I just wish it can be simpler with just function to hide price. Anyways, great one indeed. This extension is very useful and does exactly as the demo. It provides the ultimate tool to hide product price with both hide price function and call for price function. We could not be happier with the purchase. Great job! The extension does exactly as described. The backend config is admin-friendly with plenty of options for flexible customization. How to Grow Customer Database in Magento 2 Easily?